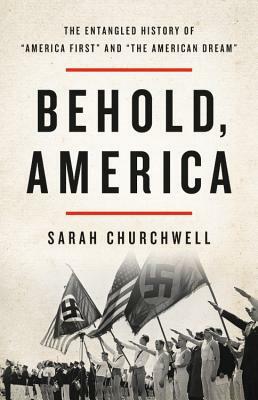 In Behold, America, Sarah Churchwell offers a surprising account of twentieth-century Americans' fierce battle for the nation's soul. It follows the stories of two phrases--the "American dream" and "America First"--that once embodied opposing visions for America. Starting as a Republican motto before becoming a hugely influential isolationist slogan during World War I, America First was always closely linked with authoritarianism and white supremacy. The American dream, meanwhile, initially represented a broad vision of democratic and economic equality. Churchwell traces these notions through the 1920s boom, the Depression, and the rise of fascism at home and abroad, laying bare the persistent appeal of demagoguery in America and showing us how it was resisted. At a time when many ask what America's future holds, Behold, America is a revelatory, unvarnished portrait of where we have been. Sarah Churchwell is professor of American literature and public understanding of the humanities at the University of London. The author and editor of several previous books, including the acclaimed Careless People: Murder, Mayhem, and the Invention of the Great Gatsby, she is a native of Chicago, now living in London.